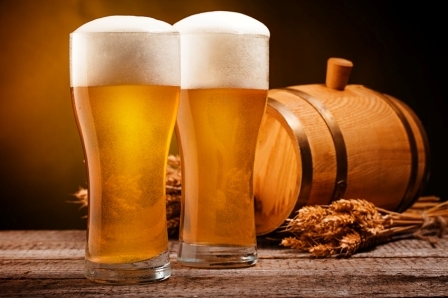 Efficiency is an important number to understand for all grain beer brewing. Your system efficiency determines the original gravity of the beer as well as how much grain is required to develop a given recipe. Understanding the difference between mash and brewhouse efficiency is also important – as it also drives the grains required. Lets start with a discussion of the basic idea of brewing efficiency. When we add grains to our all grain beer, each grain has a potential associated with it. The potential is a measure of how much sugar a given pound of grain can contribute. A pale malt might have a potential of 1.037 for example. Typically to estimate original gravity we take the potential of a grain (1.037 for example) and convert that to points by dropping the 1 and multiplying by 1000. So a pale malt with a 1.037 potential contributes 37 points per pound of grain. We use these point contributions to directly calculate the potential sugars for the entire recipe. By taking the number of pounds of malt and multiplying by the potential points for each malt we get a contribution for a given malt addition. We then can sum these up for all grains in the recipe to give an overall potential number of points. If we then divide by the volume of the recipe in gallons, we can directly estimate the recipe’s overall potential gravity points for ideal conditions. For example, if we had 10 lbs of 1.037 malt in a 5 gallon recipe, the overall potential would be (37 * 10 / 5) = 74 points, which would under perfect laboratory conditions give us a beer with an original gravity of 1.074. This is what would be produced if a brewery were 100% efficient. However, in the real world, no brewing system is 100% efficient. Losses in each step of the brewing process occur, and the difference between the “ideal” gravity and “real” gravity represents the efficiency of the system. Now that we understand how to calculate the “ideal” potential points for a recipe, we can talk about the difference between mash and brewhouse efficiency. Mash efficiency is simply the percentage of “potential” sugars that are extracted from the grains during the mash. It is typically a percentage in the 80% range. If we take the “potential” points of the grains, and multiply it by this percentage we get the points extracted from the mash. Using the example above, 74 points * 80% gives us 59.2 points or a gravity of 1.059 going into the boil. However, since the mash efficiency only includes losses occurring during the mash and lauter process, it will give us an estimate of only the boil gravity and not the original gravity of the beer. A real world brewing system has additional losses after the mash process is complete. These includes boil off, deadspace during the boil and transfer and trub losses (the gunk left after the boil). Each of these will further reduce your original gravity into the fermenter. The number that captures all of these losses plus the mash efficiency is called the brewhouse efficiency. Brewhouse efficiency is typically a number in the range of 72% for most home brewing size systems. Since brewhouse efficiency includes mash, boil, transfer and trub losses, it can be applied directly to the “ideal” number we discussed earlier. So again using the example from above, our 10 lbs of malt gives us 74 points under “ideal” conditions. Using a system with 72% brewhouse efficiency we come up with a potential of (74* 72%) = 53.2 points which is an original gravity of 1.053. So brewhouse efficiency is simply a measure of the overall efficiency of the brewing system encompassing both the efficiency of the mash and lauter process as well as losses in the system during boil, transfer and volume lost to trub. Brewhouse efficiency generally remains constant from batch to batch when brewing on the same system, so once you dial in your brewhouse efficiency you can use it to build future recipes. To “dial in” your brewhouse efficiency you simply bump it up a bit if your original gravity from a batch comes in high, or lower it a bit if your original gravity comes in lower than expected. Ideally, you should also meausure your volume into the fermenter, as small variations in volume can throw off your estimates. The one exception is when brewing a “high gravity” beer. Brewhouse efficiency generally goes down when brewing “big” beers, largely because the mash efficiency declines. This is due to the fact that you are brewing with a much higher proportion of grains to total water used. You won’t extract as much sugar as you normally would when brewing a high gravity beer. As a result, you should lower both the brewhouse and mash efficiency when building a high gravity recipe. Beersmith frustrates me because it forces me to dial in the Brewhouse Efficiency, then derives the Mash Efficiency from that. From my point of view (as a mere homebrewer) Mash Efficiency is the only thing that’s a ratio (e.g. 70%). Everything else is just a straight deduction of x litres to get from from the pre-boil volume to arrive at the volume I end up bottling. Those are all constant deductions of volume, Mash Efficiency is the ratio that determines the OG of the beer. So I’d much rather dial in the Mash Efficiency, then specify the constant deductions of volume after that, then let Beersmith work out what my Brewhouse efficiency is – it’s an interesting number, but not important to me. 1. In your example, you said that “a pale malt might have a potential of 1.037”. Is this value provided by the malt supplier? If not, how do you determine this value? 2. Under “Mash Efficiency”, you use the figure of 80% as a typical mash efficiency. How would I go about calculating an actual mash efficiency for my specific equipment? Won’t boil off increase gravity and decrease volume and the other losses listed decrease volume into the fermenter but not change gravity? Like others, I am confused by this article as well. Mainly because Brewhouse Eff shouldn’t include post-boil losses, and didn’t for centuries- until BeerSmith decided to include them (with other brewing SW packages following suit). The reasons why post boil losses should not be included in BHE have been made abundantly clear, in many discussions on many forums, some of which you have knowledge of. Why there is a new blog post perpetuation the fallacy of how it’s better to include post boil losses in Brewhouse Eff is disconcerting. It hard to know where to start in attempting to address the inaccuracies in this post. It’s like a Twilight Zone episode, and it almost seems like this is a propaganda piece meant to further confuse the brewing public about Brewhouse Eff and Mash Eff, rather than inform them. Either by design, or by error, you have made a mess of the worlds of PPG, SG, OG, and Volume. The OG of the beer is solely determined by the boil gravity- pre-boil by mash/lauter eff, and post-boil by boiloff rate. This is regardless of how much post-boil transfer/trub loss there is. There is no efficency component to boil-off, it merely determines how much the SG increases in reaching the OG of the beer. This simple relationship is why Brewhouse Eff has “always” been “to the kettle”, and not “to the fermenter”. Post-boil losses are merely simple volume losses of full OG wort. You were probably trying to convey the PPG losses and SG decrease due to dilution to make up volume, but all those confusing (to you) concepts are only there because you are looking out at the problem from inside the fermenter. The difficulty you are having explaining it is merely a symptom of that viewpoint. Move inside the kettle, and things become much easier, both to explain, and understand. No. There is so much wrong with this section. Besides boil-off having nothing to due with losses that affect OG, it actually INcreases the OG. Boiloff can affect PPG “to the fermenter”, but only because it decreases the kettle VOLUME, thereby increasing the PPG lost to trub/transfers, but that’s not what you said. Again, because of your view looking out from inside the fermenter, you have mixed up worlds that can’t be directly compared. You will have to stay in the PPG world, as confusing as that is to everyone, you included, otherwise you make no sense. Or, you could start making things easier for everyone, you included, and remove post-boil losses from your efficiency metric. It really is as easy as treating post-boil losses as a simple increase to the target kettle volume. You could even call it “batch size”, because that’s what it is. Of course, kettle target and fermenter target also work. I am assuming your confusion and mixing of analysis strategies comes from being too immersed in the “to the fermenter” Brewhouse Eff world of BeerSmith. There is a way to make your statements valid, but only if you strictly limit yourself to talk of sugars in PPG, or sugar weight/mass at each step. However, that would be very confusing, and not very useful for a high level “layman’s” explanation. For a detailed analysis of the math and algorithms involved, maybe. Much more useful is to talk about efficiency and SG, like you were doing (although incorrectly); although, this would mean abandoning the inclusion of post-boil losses in any related efficiency metric. If you just give it a try, it really does work better. You simply account for post boil losses by increasing the post boil kettle volume by the same amount. It makes it easier for everybody, I promise; and actually, you’re already doing it, just in a roundabout, confusing to everybody, way. What may be compounding your confusion is the implementation within the BeerSmith code. Done correctly, even if choosing to use as the primary tuning input, a Brew House Efficiency that includes post-boil losses, those losses should really be “backed out” right from the start. A true “kettle based” Brew House Eff should be determined before any meaningful calculations are done. If BeerSmith doesn’t do this, it would be something to be concerned about, and would explain a lot of the incoherent ramblings in trying to explain how the post-boil OG of the wort is affected by post-boil losses (because, in those terms, it’s not). Additionally, if you look at recent forum discussions, even on BeerSmith’s own forum, brewers are abandoning the “trub loss” field (using “zero” in it) due to the complexities it introduces- to Brewhouse eff and other things. They are also coming to understand that kettle (or fermenter efficiency) isn’t a static number from brew to brew, but one that varies significantly between recipes. They are realizing that focusing on mash conversion metrics, which are very consistent between recipes, provides for much better predictions and system diagnostics. recipes. In this blog post, you allude to the varying Brewhouse Eff for high/low gravity recipes, yet that goes against the core tenets of BeerSmith. Including post-boil losses in BHE only serves to ‘hide” where system issues might reside; make recipe sharing more difficult, and add to the confusion when adjusting for more/less trub/kettle loss. Only an accountant would be interested in a “fermenter” based BHE %, since the only additional information gained over using kettle based BHE % is a truer “cost per beer” into the fermenter. Even then, an accountant will still want a post-ferment/packaging efficiency number, so this intermediate % eff metric is useless to everyone. The post-boil volume losses are only needed to determine the target kettle volume (called “batch size” everywhere outside of Beersmithlandia), so that the desired fermenter volume, after kettle/transfer losses, is met. Losing 2 gallons when transferring from Mash Tun to Kettle is not the same as losing that same 2 gallons (corrected for boil off) when transferring from the Kettle to Fermenter. The grain bill would be the same using either a “kettle” or “fermenter” based BHE, but the hopping would need to be vastly different. When sharing recipes using a BHE that includes post-boil losses (and gives a fermenter based “batch size”) serves only to obfuscates what needs to be done to adjust that recipe to a different system. Unless extra information is included, which it usually isn’t, there is no way to recreate the true kettle based BHE and volumes, which makes tuning the recipe for a new system a crap shoot at best. From a brewing perspective, there is absolutely no advantage to including trub losses in any efficiency metric. In fact they only serve to add undue complexity, since they always need to be “backed out” to get a metric of any real use, like the kettle based BHE. Additionally, the further along in the brewing process a metric is, the less useful it is for determining and adjusting for problems. A much more useful approach would be to start with Conversion Efficiency, the first metric available on brew day, then have brewing software automatically generate the metrics further along in the process. Based on system values- lauter losses, grain absorption, sparging style, etc. ; the kettle BHE numbers can be generated. It’s simple algebra. Well, maybe some linear algebra, depending on how you solve the equations. This would be a much more accurate and predictable way to brew, since, contrary to what the common dogma is, Brewhouse Efficiency (kettle or fermenter based) is guaranteed to change between high and low gravity brews. More so for batch than fly sparging, but it still changes. This contradicts the practice of “dialing in” your system to one BHE number (because that’s all that’s allowed) in BeerSmith. Using a fixed Conversion Eff number is a better fit for a “single tuning” metric, but even with Conversion Efficiency, have different efficiencies for each recipe makes more sense. For a new recipe, choosing an efficiency number from a similar recipe is easy enough to do. Based on some of you other postings, I thought there was development occurring to allow working from the mash forward (as opposed to from the fermenter backwards), but that doesn’t seem to be the case. I believe that approach will/would have improved the usabiility of BeerSmith, and increased the predictability between recipes; but based on this blog entry, that doesn’t appear to be the direction BeerSmith is headed. I noticed that some grain profiles aren’t in beersmith automatically (Roasted Barley), I had to substitute Black Barley. Might be a dumb question- but I am a beginner after all. Up to the end of “Mash Efficiency”, the article is well done. Then, for some reason, it misses one of the the most important measurement points of all – the post-boil specific gravity (after it has been cooled). No matter what losses occur after this – trub loss, transfer loss, dead space, etc., the specific gravity does not change (as long as the temperature remains constant). This becomes your final OG, and is therefore a critical measurement, from which can be calculated the important “extract efficiency”, which, for some reason is not mentioned in the article. It is far easier and more intuitive to measure your grain amounts using the “extract efficiency” than using the more complicated and variable “brewhouse efficiency”. I have been calculating this by hand (very simple calculation) for at least a decade, and have almost always achieved my target OG within 1 point (for beers generally in the range of about 1.048). As mentioned in the article, calculating extract efficiency for higher gravity beers (in the same setup) is a little different as the efficiency drops with gravity. I haven’t yet seen any data graphs for how efficiency generally changes with gravity, so I just adjust my efficiency based on past observation. It would be nice to see an article detailing (and graphing) how efficiency typically changes due to gravity, based on test results. Yep, this widely discussed aspect of this software over the past several years is frustrating and I’m a bit shocked that an “enhancement” hasn’t been made available yet. 2. boil off rate in gal/hr, not %. With these two things, we can calculate the pre-boil o.g. provided that water volumes are known, then calculate accurately the hop utilization, and unfermented wort o.g. and volume. At this point, if you for some reason care, you can calculate the ‘brewhouse efficiency’, but again, my point is that this is not a meaningful number for recipe formulation. The frustrating part of the comments made so far is that many of you are yelling about the BHE definition presented by BeerSmith is incorrect. You then go on to explain what it should be. However what you explain is what the Mash Efficiency is. So it seems to me that many of the commentators are missing is the fact that Mash and Brewhouse are *two different* efficiency metrics with two different uses and calculations. So, before continuing, let’s make note of how “Brewhouse Efficiency” can be defined, which may or may not match your definition. If it doesn’t, then stop focusing on the word “brewhouse” and start focusing on the meaning. I look at BHE as a measurement that is a function of both gravity (mash) and volume. Why? Because this will give us an overall measure of the entire setup’s efficiency – that is, the Brewhouse as a whole, not just the mash or just the boil or just the whatever else. Note that because of this, the Brewhouse efficiency will not be higher than the Mash Efficiency (if mash is 70% and everything else is 100%, the best the overall system can be is 70% because component efficiencies are multiplied to reach system efficiency). Let’s look at a simple example. I have 10 lbs of 2-row with a potential of 37 PPG for a 5 gallon batch. I wind up with a pre-boil SG of 1.043 in 6 gallons of wort and a post-boil SG of 1.052 in 4.5 gallons of wort. According to mash efficiency calculations, I have hit 70%. Awesome. However, I wanted 5 gallons but only got 4.5 gallons. That’s a loss I did not expect. After factoring that in, my BHE is now 63% because my house – my entire setup – failed to achieve what was planned. Will a BHE calculated like this help with recipe building? No, but there is more to brewing than just the recipe. What it does do is help you determine if your system is on par or not. If not, this guides you to find the things that need adjusted. Suppose that you’re just “a little off” on a few things, but each time you look at those things you determine the difference is acceptable. BHE helps you realize the effects of the stack up of those issues. Maybe you decide to whirlpool post boil to reduce trub loss. The change in BHE will show how helpful that was. Just like mash efficiency, BHE lets you see the stack up of issues in your mash and search for solutions until an acceptable level is obtained. The two are helpful to know, but for different reasons. Previous post: How to Brew All Grain Beer DVD with John Palmer – Available Now!